8. Are you seeking thrills or relaxation? – Obviously a trip to the parks corners the market on thrills, with plenty of rides and adventures to be had. And a cruise is probably the most laid-back way to travel. However, there’s always ways to build relaxation into your WDW trip by spending time at the resort pool or scheduling a leisurely dinner. And Disney cruise ships have scream-worthy water slides like the Aqua Dunk for a bit of thrills while you chill. Just consider what your main objective is, and you can go from there. 7. Are you a foodie or not? 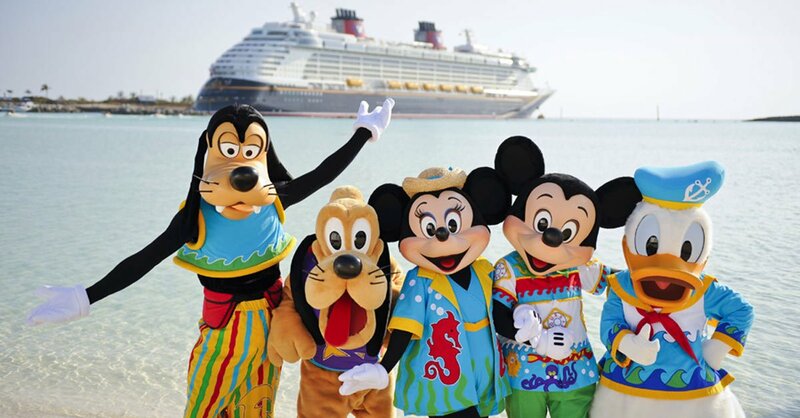 – If food is your thing, you may want to opt for a Disney Cruise. The food is AMAZING and unlimited in the cost (unless you want to schedule a decadent meal at the exclusive onboard restaurant – that’ll cost you more.) Of course there are great eats to be had inside Disney Parks too (especially in Epcot’s World Showcase – Mmmmm) but you’ll have to be more choosy and cost-conscious. 6. Are you looking for couple time or all family time? – Both Disney vacations will be incredible for the entire family. But if you and your significant other are looking for a little alone time in addition to family fun, you may want to choose a Disney Cruise. With extremely safe drop off procedures in the Oceaneer Kids Club and Flounders Reef Nursery, parents and guardians can truly relax knowing their kids are having a super fun time. 5. Are you looking for spacious accommodations? – If you are looking for a room to spread out in, you’ll be hard-pressed to find that onboard a cruise ship. The cabins are very nice and have all you need, but they are tight by necessity. A resort room either on or off Disney property will be far more spacious and will feel more like a home away from home. However, a cabin with a veranda balcony can help with the cruise-ship-cramped feeling, if you are worried about claustrophobia. 4. Do you get seasick or crowd-sick? – Ok maybe “crowd-sick” is not a real word, but Disney parks are full of a LOT of people. If the thought of that many people produces anxiety in you, a WDW visit will not be a true vacation. And while the cruise ships are extremely stable, there is no accounting for weather. In rough seas, you are bound to feel movement. If motion sickness steals your magic, a cruise is not going to be a great vacation. There are ways to get around both of these issues, but they’re still ideas to consider when making a decision. 3. Are you looking for a world-culture experience or a Disney-culture experience? – One benefit of a cruise is the ports-of-call. There are multiple itineraries available that will immerse you into a culture and people much different than your own. That learning experience can be magical in itself, and of course onboard you will have the magic of Disney. But Disney Parks have EVERYTHING Disney. Doing a parks vacation is the real-Disney-deal and that magic cannot be replaced. You won’t find Cinderella’s Castle at sea. 2. Are you a planner or more spontaneous? – Some people get a thrill just from the planning stage of vacation. If that’s you, a Disney Parks vacation is right up your alley. The more you pre-plan, the better it will be. From dinner reservations to mapping your most efficient park route, there is lots to research, decide, and plan. You could do the parks spontaneously, but you won’t get as much out of it. If the thought of pre-planning makes you want to throw up, then a cruise may be ideal for you. All activities and meals are planned for you. You just consult your Navigator newsletter in the morning to see if you want to take advantage of any of it – or not. Whatever, man. 1. Do you crave simplicity or complexity? – A Disney cruise will be the most simple vacation of your life. Once onboard, if you’ve got your key card and sunglasses, you’ve got everything you need. Disney parks will be more complex. You’ll need to pack a day bag, account for the weather, make Fast Pass reservations, navigate transportation, scout out restrooms, and more. It has the potential to stress some people out…but for others, that’s the kind of stuff that makes them come alive. Of course, all of life is as simple or complex as you want to make it, and no matter which vacation you choose, that fact still remains. So there you go – a few questions to ask yourself as you decide which vacation suits you best. The best part? No matter which you choose, you can never go wrong. There’s no bad decision when it comes to a Disney vacation!